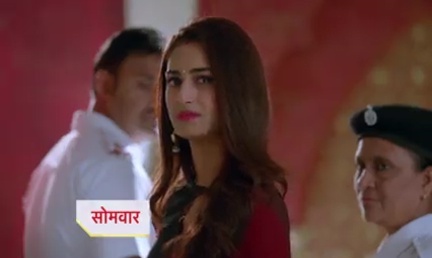 Home Kasauti-Zindagi-Kay-2-latest-News-update Kasautii Zindagii Kay 12th April 2019 Written Update " Police Comes to Arrest Prerna Anurag Supports Prerna "
Kasautii Zindagii Kay 12th April 2019 Written Update " Police Comes to Arrest Prerna Anurag Supports Prerna "
Kasautii Zindagii Kay 12th April 2019 Written Update " Police Comes to Arrest Prerna Anurag Supports Prerna ." Prerna reveals to Komolika how Anurag tricked her when he was with her in the changing room. She tells Komolika that Anurag is playing with both of them. Komolika doesn't want to listen to her and she asks her to leave. Prerna continues to add fuel to fire and suggests Komolika leave the house as she's going to get nothing because Anurag loves only her. Komolika gets irritated and pushes Prerna to get her out of the room. Prerna gets concerned about her baby and asks Komolika not to push her. Komolika moves ahead to push her again but Prerna pushes her back hard. Anurag sees Prerna coming out of Komolika's room and gets worried about what she told to Komolika. He follows Prerna to the kitchen and asks her why is she provoking Komolika. Prerna thinks that Anurag is saying so because he's concerned about her baby, so keeps herself busy with cooking dessert to celebrate her victory. Anurag wants her to listen to him carefully. He pushes Prerna to wall, holds her hand and tells her that he's concerned about her and doesn't want her to be harmed. Prerna gets surprised, she remembers when Anurag saved her, they have an eye lock. Prerna asks Anurag to leave her and continues making her dessert. She tells Anurag that he's a betrayer, his marriage to Komolika is just a deal in which he sold his soul to her. She tells Anurag that sometimes her heart feels that he still loves her, not Komolika but that's not true. She warns Anurag that every time he'll tell Komolika that he loves her, she will tell her that he's lying and to burst Komolika with trust and she'll never be happy with him. She puts the sweet into Anurag's mouth and leaves. Komolika comes downstairs and watches Prerna forcing the relation of being a daughter-in-law over Mohini. Mohini gets angry and asks Komolika to take action against Prerna. She tells Komolika that Prerna risked Anurag's life, she'll take her place and moreover, she's calling herself her daughter-in-law and insulting her. She asks Komolika to take action when she has the power to do so. Komolika asks Mohini to calm down and tells her that her friends are coming to meet them. Komolika turns furious when someone insults her, but she's not reacting at Mohini's insult, this makes Mohini angry. The doorbell rings. Anurag also comes there. Komolika requests Mohini to open the door if she wants to kick Prerna out of their house. Mohini opens the door and discovers police at the door. Police have arrived to arrest Prerna. She asks them the reason, they tell her that they came to arrest Prerna for harassing Mrs. Anurag Basu. Prerna tells the inspector that she's Mrs. Anurag Basu, Anurag's wife. Komolika tells the inspector that she has barged into their house, calls Anurag her husband and made their lives miserable. She shows inspector the papers signed by Prerna. Prerna tells the inspector that they tricked her to her the papers signed. Komolika says that Prerna signed the papers willingly but then she realized that she will lose this luxurious life, so she refused to leave. Mohini also supports Komolika's complaint against Prerna. Anurag knows that Prerna needs him right now but he can't take the risk of helping her because this will turn Komolika's doubt into the belief that he loves Prerna. So, he can't help Prerna this time. While Nivedita and Mohini are giving further details about Prerna to the inspector, Komolika goes near Prerna and tells her that there nobody is interested in listening to her truth. She tells her all this is happening because of her father's power and connections and now not even she so-called husband can help her. As police have a charge and evidence against Prerna they move ahead to arrest her. Anupam tries to help Prerna and asks the inspector for a warrant. Inspector shows her the warrant. While she's being handcuffed, she looks at Anurag with hope in her eyes. Anurag comes downstairs and stops the police. He says that no one can arrest Prerna because she's his wife. Anurag's stand for Prerna leaves everyone shocked. Police arrests Prerna. Before leaving she tells Anurag that she hates him and herself too for loving him. She warns Anurag that she won't spare him.